As an educator, have you even considered how ‘identity’ is interwoven into your work? 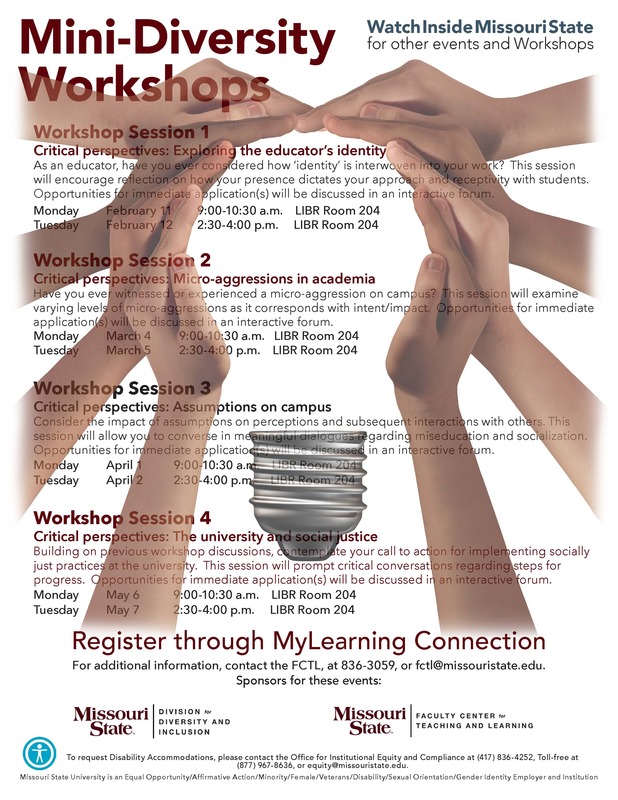 This session will encourage reflection on how your presence dictates your approach and receptivity with students. Opportunities for immediate application(s) will be discussed in an interactive forum. Building on previous workshop discussions, contemplate your call to action for implementing socially just practices at the university. This session will prompt critical conversations regarding steps for progress. Opportunities for immediate application(s) will be discussed in an interactive forum. To request disability accommodations, please contact the Office for Institutional Equity and Compliance at (417) 836-4252, Toll-free at (877) 967-8638, or equity@missouristate.edu.